Looking at this plan, one can see that first concrete deliverables are in the area of referentials (R) and organizations (O). Enforcement of these will start together with products (P) and substances (S). For P+S, the TF proposes to publish the implementation guides for the EU shortly after the ISO guides are published. Current estimates see this happening at the beginning of 2016. According to this plan, a 12 month period is given before implementation could start, plus a further nine-month transition period. During that period in 2017, the EMA plans to accept both EVMPD and IDMP messages, and will update their internal systems to work with IDMP. 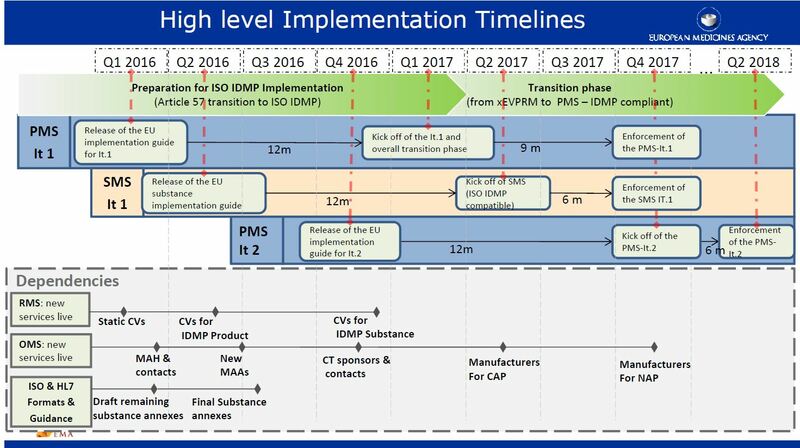 In Q4 2017, the EMA plans to mandate IDMP messages. The current thinking from the TF is that the content for these messages will be the Article 57 content plus “minimum required” elements to assign and maintain identifiers for authorized medicinal products and to support product life cycle management (MPIDs, PCIDs and PhPIDs). In effect this means “EVMPD++ data in IDMP language”. If this plan is approved and implemented, industry believes there will be more time to plan and implement necessary actions for becoming IDMP ready. Industry sees Q3 2017 as a reasonable timeframe. This gives the chance for ongoing projects to re-evaluate decisions taken in the light of time pressure, to have the opportunity to plan with a longer time-frame and the chance to deploy other resources to address the requirements. What “IDMP ready” actually means remains to be defined. From our perspective, “IDMP ready” could be understood to mean that the Product Data Management (PDM) system must include all the data and be ready to create and send it in IDMP format. Therefore any ongoing activities that collect and structure the required data elements should be continued, and any data governance and data collection/storage procedures that are currently defined should also be in place and working. Looking at the overall approach after Q4 2017, it should be noted that there are several extensions planned that industry will need to consider. The iterative approach proposed by the TF will require industry to continuously update/extend its processes and tools. So plans to implement IDMP must build in an ability to respond to change. Another interesting point is that the EMA has raised the priority level for Investigational Medicinal Product IDs (i.e. development products) which are currently planned to be addressed in Iteration #2 (enforced Q2 2018). The TF will now approach the European Commission and ask for their view on whether this proposed plan meets the legal requirements. Information on this should be available in September 2015 at the latest, and will be communicated following the next TF meeting. The EMA and NCAs seem confident that the Heads of Medicines Agencies and then the Commission will accept these proposals. Their logic is that if all agencies agree on a realistic and feasible approach, the Commission won’t try to push parties to achieve the impossible. Information based on work from the EMA ISO IDMP Task Force (http://tinyurl.com/patoc8z) and analysis papers from A. Marr / Marr Consultancy Ltd (http://www.marrconsultancy.com). & Markus Pfahlert, Product Manager LORENZ drugTrack at LORENZ Life Sciences Group.